Pure and Simple Titanium-Brown | R.G.E. | Reading Glasses Etc. 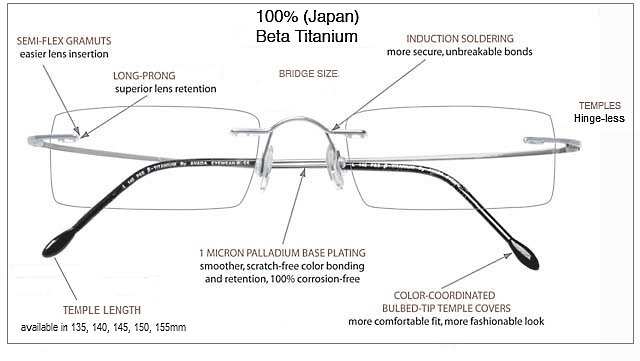 Pure and Simple Titanium Brown custom rimless reading glasses are as light weight as you can get. Made from high quality Beta Titanium and currently in 5 colors. The quality is as good as the Silhouette Minimal Art Must design, and I say that with confidence, having seen just about every other Silhouette knock-off there is. This is a hinge-less frame and comes in a special hard shell case to help protect them and keep them in alignment. Quality is top-notch and guaranteed. Create Your Own Rimless Reading Glasses! 4-Choose Your Temple Length: You can select a 135, 140, 145, 150, or 155mm length. If you have a pair of eyeglasses that fit you, you can use that length. Frame sizes are usually visible on the inside of the temples and look like this: 50-19-140. The last number is the temple length. April suggests choosing longer if you have doubts. Our Mojo AR (anti-reflective coating) is perfect for cutting reflected glare! The AR Coating is bonded to the lens surface, not painted on like cheaper coatings. In addition, our lenses have additional coatings that make the lenses more scratch resistant and easier to clean. Our Tint Selection- If you would like a tint, select the tint color and tint depth. Our Mojo BluBlock Tints block out uneanted blue light. Perfect for iPad, Tablet and computer use. Tint depths of 15 and 30% are good for indoor use. Tint depths of 45 and 60% are for outdoor use. Read more about our lens tints.